Holds 4 Wine Glasses and Wine Bottle (not included) 9 1/2 In. W x 9 1/4 In. H x 6 1/2 In. 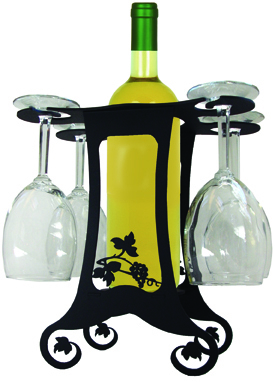 D Grapevine Design - Wine Holder SKU: WRC-B-157 UPC: 604414025385 Product Weight: 4.00 lbs. Non-contiguous and international areas must use a package forwarder if you would like to order this product.